Eckstein the oddsmaker says: The daughters are bad girls, and that’s why. I think the mother will be around for a while. The A.V. Club says: If someone’s got to go this week, it might as well be them. Eckstein the oddsmaker says: Ghost will never die, but Arya’s direwolf might get it. The A.V. Club says: We haven’t even seen Nymeria since season one. Her showing up in this episode just to die would be a twist none of us would see coming. Eckstein the oddsmaker says: Enough with the smoke already. The A.V. Club says: She’s on her own and heading south. Who knows what perils will befall her on the way? Eckstein the oddsmaker says: I will cry, but the big girl has to go. The A.V. Club says: First of all, we see what you did there, Benjamin, and we like it. On the other hand, we won’t like Brienne’s death, and we don’t like these odds. Eckstein the oddsmaker says: He reminds me of a young Donald Trump. The A.V. Club says: Like Donald Trump, we think he’ll unfortunately be sticking around for at least the foreseeable future. Eckstein the oddsmaker says: He’s getting old, and doesn’t have the fire anymore. The A.V. Club says: He has to die eventually, but we’re not sure it’ll be this week. Eckstein the oddsmaker says: He might die, but he won’t really die, because he’ll go back in time to be Bran The Builder of the wall. The A.V. Club says: Bran’s in a bad spot, but it seems unlikely that Thrones will just off another Stark week one. Eckstein the oddsmaker says: He still has a sister that he wants to date. The A.V. Club says: First of all, gross. He’s probably not going this week, though. He has too much to do still. Eckstein the oddsmaker says: These ladies ain’t going anywhere. Girl power, baby! The A.V. Club says: Cersei just got on the throne, so she’s not going anywhere. Same thing for Arya, who exists on pure vengeance. Eckstein the oddsmaker says: It’s not going to happen. The A.V. Club says: It’s tempting to throw our money behind one of these and then just win the game automatically, but Eckstein’s probably right here. Who emerges victorious in the battle of The Mountain v. The Hound? Eckstein the oddsmaker says: I think it’ll be Volcano, their half brother. The A.V. Club says: We’d certainly like it to be The Hound, but can The Mountain even be killed? 3-1 Jon Snow and Daenerys Targaryen will sit on the throne together at the end of the show. Erik Adams: $20 on the Cersei under, $80 on the total deaths under. Danette Chavez: $10 on the total deaths under. Marah Eakin—last year’s victor: $20 on the total deaths under, $10 on Davos, $10 on Brienne, and $10 on a Sand. Leo Garcia: $65 on under. Season Bets: $5 on Cersei’s under. $5 on Jon’s parentage under. $2 on The Hound in Clegane Bowl I.
Josh Modell: $60 on the under. John Teti: $10 on Melisandre and $50 on the total-deaths under. Grace Thomas: $20 on the over, $10 on Davos, and $5 on Jon Snow’s parentage being revealed in under 5.5 episodes. Emi Tolibas: $25 on the over for total episode deaths. Caitlin PenzeyMoog: $40 on the total deaths under, $5 on the Cersei under, $5 on a Sand, $5 on the under of Jon’s parentage, $5 on The Hound beating The Mountain. 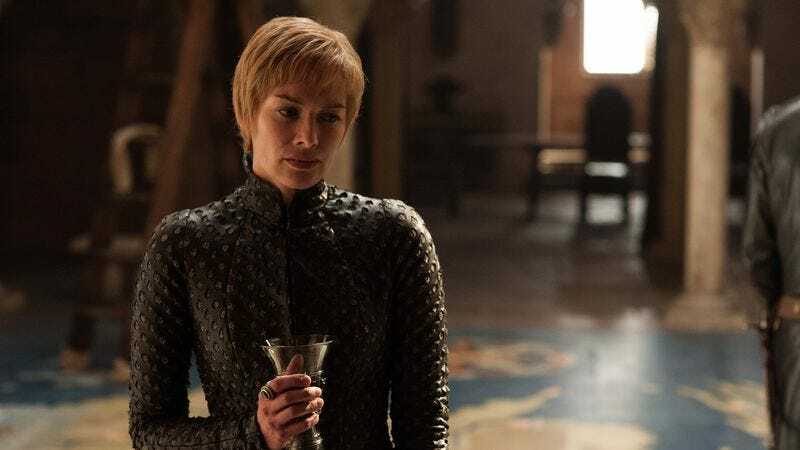 Kristi-Lynn Jacovino: $5 on Melisandre, $5 for the over of total named deaths, $15 for under 8.5 episodes for Cersei gone from the throne, and why not add $15 for the under on Jon’s parentage. Karl Blomberg: $20 on total deaths—under. $10 on Cersei on the throne—over.